In a slightly surprising move, Sky has announced that it has forged a new partnership with Netflix in Europe. New and existing customers will be able to 'seamlessly' make use of the new Netflix app through the Sky Q platform. We don't have a precise date for the Netflix / Sky Q integration other than the rather vague "in the coming year". 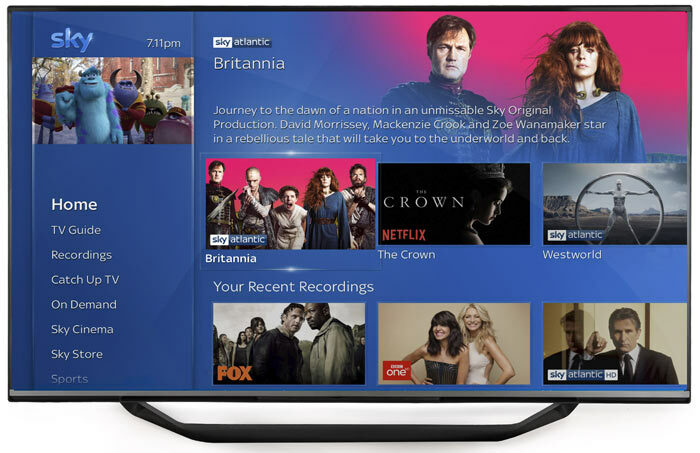 As part of the partnership Sky Q customers will be able to add Netflix to their viewing options in a brand-new and attractively priced entertainment TV pack, combining Sky and Netflix content side-by-side for the first time. Thus a single bundle will offer thousands of hours of UHD content. Within the Sky Q TV interface users will see Netflix programmes promoted alongside Sky content and they will all be voice searchable. In addition to this you also get access to free-to-air TV and various other services. Existing Netflix subscribers can carry on with a separate subscription to the popular online streaming service if they wish, simply signing into the Netflix app on Sky Q. However, Sky reckons it will be even more convenient to roll Netflix into your single monthly payment. The European partnership will see Netflix - along with the new Sky TV pack - launch on Sky Q in the UK and Ireland in the coming year. Netflix will launch on Sky Q platforms in Germany, Austria and Italy thereafter. Sky's agreement with Netflix goes beyond the Sky Q platform to include its contract free Now TV streaming service and devices. In the UK and Ireland Netflix will become available as a standalone app for Now TV devices. Sky Ticket in Germany and Austria, and Now TV in Italy, will launch a standalone app on their devices in due course. In related news, Variety reports that Netflix is set to spend upwards of $8 billion on content in 2018. Its exclusive content is seen as key to driving up the subscriber base and the huge investment earmarked this year is a driving force to create compelling viewing. In 2018 it is expected that 700 original TV shows, and 80 original films, will be produced by the company. And Netflix has announced it will invest $800 billion in TV and film content this year. Might want to adjust the heading on the Home Page guys! New devices will come with the app pre-installed, older ones can head on over to ‘App store’ to grab it. For those that don't know, that isn't 4 devices streaming at once (I think you are allowed 2), that is 4 devices at any time that you can stream to. Sadly a Chromecast counts as one device despite having the device I am casting from (a tablet) as an enabled device, so to watch NowTV on the small TV we have near the cross trainer takes me two devices. You can delete as many devices off your list of enabled devices you want, but you can only add one per month. An utterly frustrating limit that Netflix and Amazon just don't seem to have.